Linger is a beautiful, elegant, and searing sequel. It contains all of the drama and romance of Shiver, but also possesses a new urgency as secrets are kept and tensions rise. Linger opens up Sam and Grace's world to include Cole and Isabel as narrators, and divulges even more about the wolves and how they live. Stiefvater reveals some wonderful character growth for each of the four narrators as well; Sam is still trying to get used to the fact that he is fully human and has a future ahead of him. Grace is feeling the stress of keeping secrets from her parents and Sam and her anger at her parents' constant absences. Sharp-tongued Isabel suffers from guilt at her part in her brother's death, and even though she'd like to stay away from the wolves, she can't help but be drawn to Cole, a sardonic boy who chose to be a wolf to escape the problems in his human life, but is finding that being a wolf is actually making him confront the things he has tried to bury. These issues that force the characters to evolve keep Linger from seeming like a transition from Shiver to the next book, and give it enough drama and tension to keep you rapt, especially during the climactic final scenes when Sam, Grace, Isabel, and Cole realize that the inner workings of lycanthropy may not be quite as they thought. Stiefvater's writing is breathtakingly beautiful, as precise and affecting as poetry, and Linger is emotional, heartbreaking, and heart-pounding as the stakes are subtly raised for not just the main characters, but for every wolf in Mercy Falls. Cover Comments: I am in love with this design! It's just beautiful, and I cannot wait to receive a finished copy to inspect every page. I hope it is just as cool as Shiver! Linger will be released on July 1st, 2010. Click here to read my review of the sequel and final book in the trilogy, Forever. Awesome review! 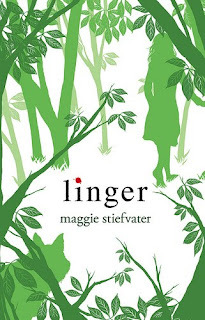 Now, I'm really dying to read Linger. Shiver is one of my favorite novels. And to be able to see what I could expect from Linger, just makes me more eager to read it. Fantastic review! I can't wait for this one. Shiver was amazing! I'm so jealous! I can't wait for Linger, Shiver was amazing! I'm so glad that this one measures up to Shiver! Great review, and I can't wait for it to be released! I could barely wait for this book BEFORE I read your review Now, I'm dying to get my hands on it! I just finished reading Shiver last night! Well, I pretty much started it yesterday, too, it's just so good that I could not stop reading! Shiver was amazing and I seriously cannot wait to read Linger! I can only imagine the conflicts to come! And now with two more points of view, Linger is sure to be breath taking! I REALLY REALLY WANT TO READ IT NOW! I NEED THE MONEY 1ST THOUGH! LMAO! But serious too......... i love dotz....... anyway, i want this book itz driving me insane to not read it! Grace and Sam are WAAAAY better and more defined than Bella and Edward. I liked these books more than the Twilight Saga. This book is very much amazing, Awesome review. Shiver is one of my favorite novels.